CAMBRIDGE, MASS. – APRIL 2, 2013 – Researchers at Tufts University School of Dental Medicine and the Forsyth Institute published a study today that found that a significant proportion of dental bib clips harbored bacteria from the patient, dental clinician and the environment even after the clips had undergone standard disinfection procedures in a hygiene clinic. 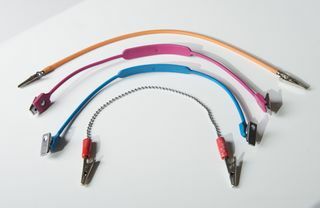 Although the majority of the thousands of bacteria found on the bib clips immediately after treatment were adequately eliminated through the disinfection procedure, the researchers found that 40% of the bib clips tested post-disinfection retained one or more aerobic bacteria, which can survive and grow in oxygenated environments. 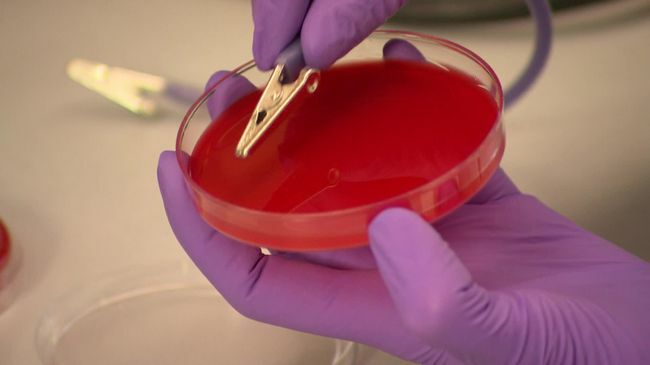 They found that 70% of bib clips tested post-disinfection retained one or more anaerobic bacteria, which do not live or grow in the presence of oxygen. The full study titled “Comprehensive Analysis of Aerobic and Anaerobic Bacteria Found on Dental Bib Clips at Hygiene Clinic” will be published as a supplement to the April issue of Compendium of Continuing Education in Dentistry, one of the leading dental journals in the U.S., and is now available for download at www.dentalbibclipbacteria.com. 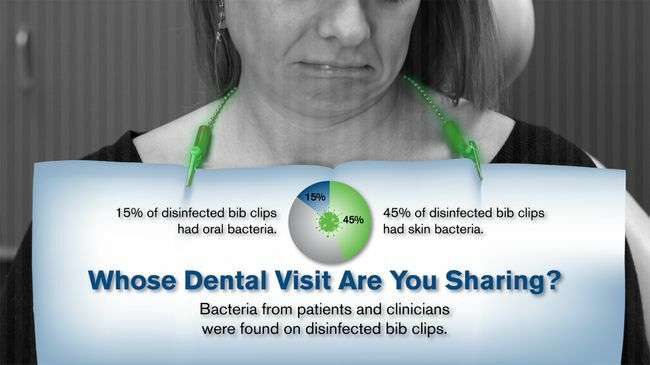 The study analyzed the clips on 20 dental bib holders after they had been used on patients treated in a dental hygiene clinic. The bib clips were sampled for aerobic and anaerobic bacterial contaminants immediately after treatment (post-treatment clips) and again after the clips were cleaned using disinfecting, alcohol-containing wipes (post-disinfection clips) according to the manufacturer instructions and the clinic’s disinfection protocol. Immediately after treatment and before the clips had been disinfected, oral bacteria often associated with chronic and refractory periodontitis were found on 65% of the clips. After disinfection, three of the bib clips (15%) still had anaerobic Streptococcus bacteria from the oral cavity and upper respiratory tract. Five percent (5%) of the clips still harbored at least one bacteria from the Staphylococcus, Prevotella and Neisseria species. Additionally, after disinfection, nine clips (45%) retained at least one anaerobic bacterial isolate from skin. Oral bacteria present in the patient’s saliva and the spray or spatter produced during dental treatments may contribute to the presence of bacteria on the disinfected bib clips. Bacteria can also be transferred from the gloved hands of dental practitioners to the clips prior to- or during the patient’s treatment. 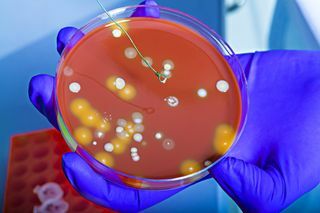 Bacteria can be transferred from the patient’s hands to the clips if the patient touches the clip. In a previous study published in August 2012 by researchers at Tufts University School of Dental Medicine and the Forsyth Institute it was found that 20% to 30% of dental bib clips still harbor aerobic bacterial contaminants even after proper disinfection procedures. 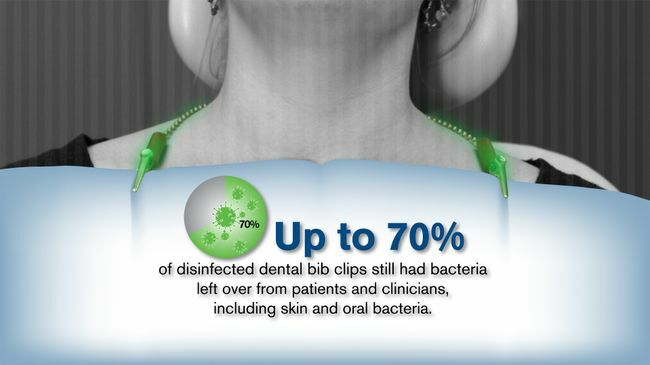 Rubber-faced metal bib clips were found to retain more bacteria than bib clips made only of metal immediately after treatment and before disinfection. 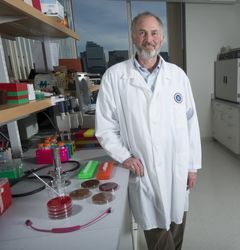 Four other research reports have found bacterial contamination on dental bib holders, including research conducted by U.S. infection control specialist Dr. John Molinari, the University of North Carolina at Chapel Hill’s School of Dentistry Oral Microbiology lab and the University of Witten/Herdecke in Germany. 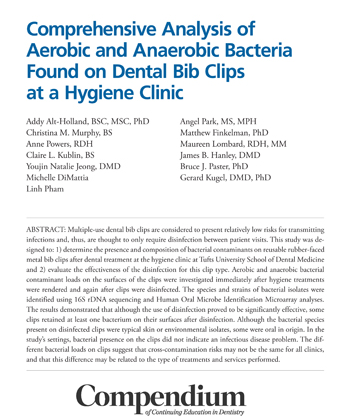 Visit www.dentalbibclipbacteria.com to download a full transcript of the research paper “Comprehensive Analysis of Aerobic and Anaerobic Bacteria Found on Dental Bib Clips at Hygiene Clinic”, a supplement to the Compendium of Continuing Education in Dentistry Volume 34, Number 4, 2013. The authors of the study include: Addy Alt-Holland, BSC, MSC, PhD; Christina M. Murphy, BS; Anne Powers, RDH; Claire L. Kublin, BS; Youjin Natalie Jeong, DMD; Michelle DiMattia; Linh Pham; Angel Park, MS, MPH; Matthew Finkelman, PhD; Maureen Lombard, RDH, MM; James B. Hanley, DMD; Bruce J. Paster, PhD; and Gerard Kugel, DMD, PhD. The Forsyth Institute is the world’s leading independent organization dedicated to scientific research and education in oral health and related biomedical sciences. Established in 1910, Forsyth’s goal is to lead the discovery, communication and application of breakthroughs in oral health and disease prevention that will significantly improve the health and well-being of the nation and the world. The Forsyth Institute is affiliated with the Harvard School of Dental Medicine. For more information about Forsyth, visit its website at http://www.forsyth.org. Always make sure the clinician puts on fresh gloves before beginning treatment in your mouth. 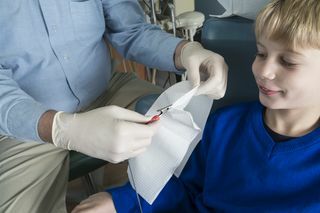 If the clinician touches anything else with his/her gloves – the bib clip, the computer, his or her face – you have the right to ask them to change their gloves. Don’t close your mouth around the suction used during cleaning and procedures. Instead, ask the dental clinician to do the suctioning during the procedure. Although the nozzle at the end of the suction tube is disposable and replaced between patients, the tube is typically only cleaned once per day. Closing your mouth around the suction can cause backwash from the tube to enter your mouth introducing bacteria from other patients’ saliva, blood and oral substances. Make sure you see the dental hygienist open a fresh sterilization pouch of instruments, and if you don’t see it opened in front of you, ask how the instruments you see were sterilized. All dental instruments used on a patient should be sterile. Make sure you see dental professionals are wearing gloves, coveralls, glasses and a mask during all procedures, including a cleaning. If you notice something is missing, give the dentist or hygienist a friendly reminder. Wash your hands thoroughly with soap and water or antibacterial hand sanitizer before leaving the dentist office.